The success of our foundry is based upon competence in three areas of activity: as well as classic construction casting, ACO manufactures machine-moulded components and continous-cast bars. This competence is reflected via supply of demanding cast parts such as used in drainage systems for the construction industry, brake discs for rail vehicles, components for transmissions or for applications in the pump and hydraulics segments. We produce bespoke high-quality cast parts on our automated HWS moulding line. A consistent high quality is assured through modern production technology with automatic pouring and an S7-system which controls, monitors and continuously records parameters for the flexible cooling line. The „GussPlus“ full-service concept that guarantees our customers complete insight throughout the entire process from development and production through to finishing and even thereafter, rounds off the service portfolio. 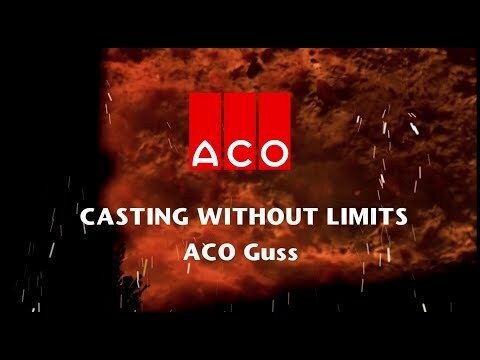 As well as machine-moulded casting, the ACO Guss Group has competence in the area of continuous casting. The cast-iron bars so manufactured are marketed by the subsidiary ACO Eurobar. Based upon application know-how and quality products, ACO Eurobar has evolved to the largest producer of continuous-cast iron in Germany and one of the key players in Europe. As a continuous-casting specialist backed-up with a state-of-the-art machine shop, ACO Eurobar today markets a complete range of products from standard as-cast bars to pre-machined semis and fully finished components in different grades of cast iron. Hydraulics, mechanical and machine-tool engineering, glass manufacture and automotive are examples of segments in which quality continuous-cast products from ACO Eurobar® find application. The Michelbacher Hütte in Aarbergen, founded in 1652 as an ironworks, is also closely associated with ACO's foundry tradition. Cast iron products for drainage, including the familiar manhole covers, have been manufactured here since as early as 1885. A member of the ACO family since 2000, the Aarbergen site is today the competence centre for construction casting encompassing a concrete factory, painting lines, a machining shop and central logistics for the ACO Group. Among other things, manhole covers as well as inlet grids for drainage made of cast iron and concrete as well as cast parts for building drainage are manufactured here. ACO Guss GmbH attaches great importance to manufacturing processes which are both environmentally-friendly and conserve resources. With this in mind, we invest continuously in the modernisation and optimisation of our facilities. Thanks to the certification of our energy-management system according to ISO 50001, we have significantly lowered CO2 emissions and energy consumption. In the development of new innovative materials, ACO Guss aims to provide alternatives to steel and other strategic materials where lower weight is a decisive advantage. And furthermore: cast iron is 100% recyclable!